Have you ever heard the term homunculus? If you Google it you get images of a funny-looking human with enormous lips and enormous hands. 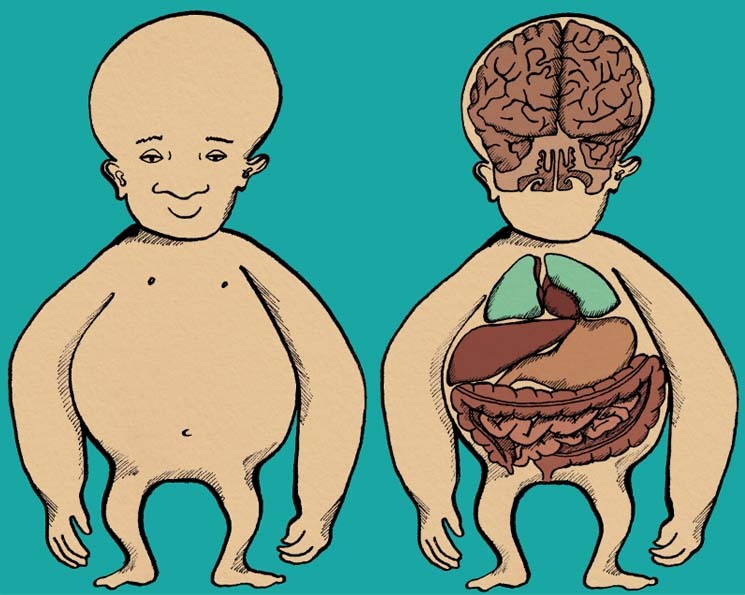 The homunculus is a visual representation of what our body looks like to our brains. In our culture we tend to separate out the brain and the body but they are intricately connected. All through our bodies there are sensory receptors that send information about the world to our brains via a complicated system of nerves. In parts of our bodies, such as our hands and our mouths, we have a lot more of these sensory receptors than other parts of our bodies, say your thigh for instance. Hence, to the brain our hands and mouths seem much bigger on a sensory level than they are in reality. There are two versions of this cortical homunculus: a sensory and a motor form. 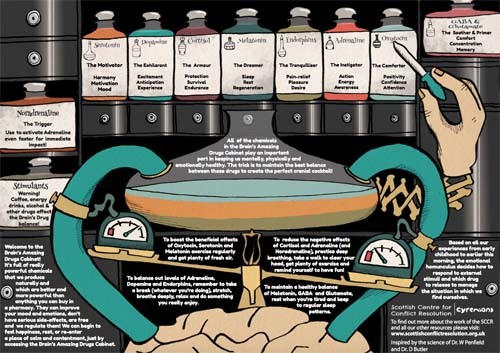 Last year the Scottish Centre for Conflict Resolution (SCCR) approached me to work with them to develop an emotional homunculus: a way of showing how the body looks to your brain when you are in a particular emotional state. SCCR have been doing some amazing work to help young people and their families make sense of the brain biology of the teenage years and how our brains work in conflict situations. The human brain is being re-wired during our teenage years at the same rate as it is being wired between the ages of 0-2. No wonder it’s a tough time! Then we throw in family breakdown, poverty, exams, job loss, illness, social media, peer pressure. Families need as much support as possible to get through this time and the SCCR have found that understanding a bit about the biology going on in the background has really helped families. So last autumn I worked with a great bunch of people to develop this project. It was brilliant to work with the web-design team at Primate again. They are soooo good. The main idea of the emotional homunculus came from child psychology expert Dr Sara Watkin and she gave loads of brilliant help and advice as we worked out what an emotional homunculus might look like. It was also great to work with Felipe Bustos Sierra of Debasers Filums on some animations for the project*. You can see the external and internal view of one version of the emotional homunculus above. The project launched last Wednesday in Glasgow at the Glasgow Science Centre and I was lucky enough to go up and be part of it. 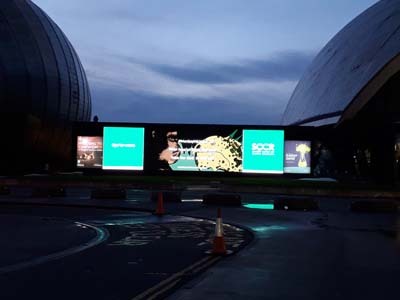 Below is a photo of one of my illustrations for SCCR on the big screen outside the Science Centre. I was just a little bit proud!!! Sorry about the dark picture. Scotland was very snowy and cold last week. Below that is another image from the project looking at the chemicals that work in your brain. You can see more about the project by visiting the SCCR website here. *Felipe has just completed a wonderful film called Nae Pasaran about a group of Scottish aeroplane engineers who refused to allow some of Pinochet’s warplanes to leave their factory in East Kilbride as a show of solidatory with the people of Chile in the 70s. They never knew if their actions had made any difference but now, through Felipe, they have. It’s an incredible story. You can watch the short here. I challenge you to watch it without crying! The feature length film with be closing Glasgow Film Festival and then hopefully you will be able to see it at a cinema near you some time after that. Felipe deserves to win every award and accolade going for this project so I hope he does! This entry was posted in Illustration and tagged 1970s, biology, brain, chemistry, child psychologist, Chile, conflict, conflict resolution, Debasers Filums, design, dictatorship, Dr Sara Watkin, East Kilbride, education, families, Felipe Bustos Sierra, Glasgow Film Festival, Glasgow Science Centre, homunculus, illustration, illustrator, mediation, Nae Pasaran, Pinochet, Primate, SCCR, science, scotland, web-design agency, young people. Bookmark the permalink. Congratulations – you’ve every right to be proud. Fascinating to hear of the project too – there seems so much still to learn about how the human brain shapes our lives. Thanks Evy. You’re right – there’s so much we don’t know. Humans are pretty amazing creatures! As always Hannah a pleasure to work with you and everyone involved in the development. Here’s to the next one. Diane, SCCR.